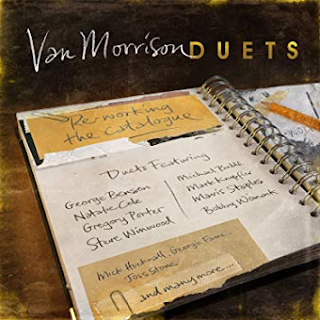 This is a 2015 compilation of Van Morrison re-visiting some of his old songs with special guest vocalists joining him. It is a most enjoyable album. He doesn't choose his well-known songs, preferring to re-work lesser-known ones which was wise, and he chooses his partners well too. "Some Peace Of Mind" from "Hymns To The Silence" - with Bobby Womack. Soulful as you would expect from gravel-voiced Bobby Womack. Nice trumpet solo too. Van on excellent improvised vocal form at the end. "If I Ever Need Someone" from "His Band And The Street Choir" - with Mavis Staples. Legendary Stax/gospel singer Mavis Staples raises this Celtic soul slow burner from 1970 higher with her by now aged, throaty but still so damn strong vocals. She laughs at one point with the sheer enjoyment of doing it. The pleasure from both of them really comes across. "Higher Than The World" from "Inarticulate Speech Of The Heart" - with George Benson. Jazzy soul guitar virtuoso Benson is a good choice for this mystical airy floaty number from 1983. Benson contributes some trademark jazzy electric guitar superbly. This version outdoes the original. Great saxophone at the end, too. "Wild Honey" from "Common One" - with Joss Stone. Nubile young soulstress Joss Stone tackles this slow, reflective number, again from the mystical, bucolic period. She takes the vocal slightly beneath Morrison's growl and provides a strong sweetness that suits the title. Her strength of vocal lends the song a real soully feel. Again, the backing is superb, as indeed it is on the whole album. "Whatever Happened To P.J. Proby?" - from "Down The Road" - with P.J. Proby. The tight-trousered sixties singer who never quite made it joins Van himself for a song about his descent into obscurity. It is played in smoky jazz club style, with an addictive stand up bass and some jazzy slow drums. Proby's voice is gruff and soulful. It enhances the track well, and it is a most atmospheric rendition. "Carrying A Torch" from "Hymns To The Silence" - with Clare Teal. Instead of Tom Jones, with whom he had duetted this in the past, Van is joined by jazz singer Clare Teal. I love this song anyway but when Clare starts her vocal part it sends shivers down my spine. One of the best duets on the album. Lovely. My goodness this grumpy old man has some soul. This song always makes me somewhat tearful. "The Eternal Kansas City" from "A Period Of Transition" - with Gregory Porter. Contemporary jazz singer Gregory Porter is on vocal duty here. A great bass intro is followed by some sumptuous, punchy brass. Porter's strong, soully voice adds gravitas to a performance that improves considerably on the original. There is a "hard bop" style jazzy solo part in the middle. "Streets Of Arklow" from "Veedon Fleece" - with Mick Hucknall. Flame-haired Simply Red singer features on this mystical, Celtic number from 1974. The mysterious feeling of the original is maintained as the flute swirls all around a haunting Hucknall vocal that really does the song justice. "These Are The Days" from "Avalon Sunset" - with Natalie Cole. Nat King Cole's daughter adds her sweet, soaring soul tones to this uplifting, gospelly song. She does a good job. The song is more jazzy than the original. It has some excellent saxophone and trumpet solos. "Get On With The Show" from "What's Wrong With This Picture?" - with Georgie Fame. 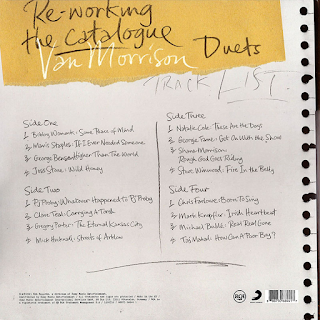 Van's old mate, sixties jazzer Georgie Fame joins him on this. It suits him perfectly. It is given a slight reggae beat and the two old friends jazz up the vocals. It is catchy and decidedly pleasant. "Rough God Goes Rising" from "The Healing Game" - with Shana Morrison. Van's daughter provides her usual high quality vocal on this track from 1997, that it played quite similarly to its original. "Fire In The Belly" from "The Healing Game" - with Steve Winwood. 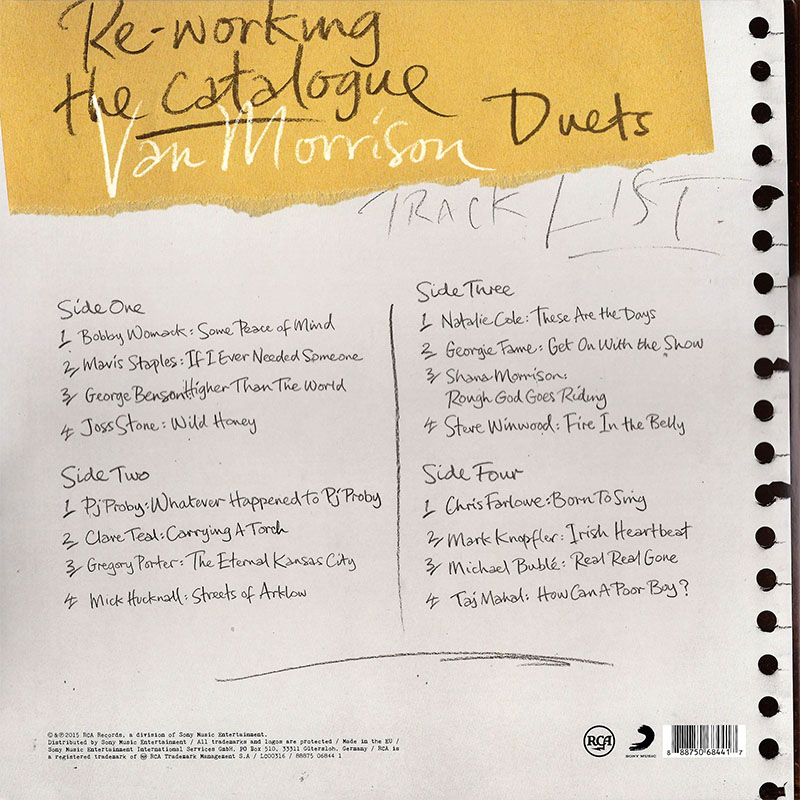 Sixties/seventies band Traffic's Steve Winwood appears on this, initially instrumentally and as the second voice to Morrison, and then they duet half way through, both singers' rasping vocals trading off again each other effectively. "Born To Sing" from "Born To Sing: No Plan B" - with Chris Farlowe. A slightly mid-tempo rock 'n' roll piano and saxophone introduces this appealing duet with sixties blues rock legend Chris Farlowe. My god, what a voice he has. The track is enhanced by some wonderful New Orleans-style brass. "Irish Heartbeat" from "Down The Road" - with Mark Knopfler. Suitably evocative, folky and beautiful rendition of this Celtic-influenced number. A bit of trademark Knopfler guitar in there too. "Real Real Gone" from "Enlightenment" - with Michael Bublé. Crooner Bublé does a surprisingly fine job on this upbeat number, the two of them enthusiastically whooping it up, in entertaining fashion. The final name checking bit is excellent. "How Can A Poor Boy" from "Keep It Simple" - with Taj Mahal. Sixties blueser Taj Mahal and Van get down 'n' dirty on this blues grinder. Mahal's voice is suitably gruff and is a great fit for the track. This is a highly recommended, quality album.